Alan R. Moon’s railroad game of railroad route building in the USA. Published in 2004 by Days of Wonder. For more information see Boardgame Geek and Days of Wonder. 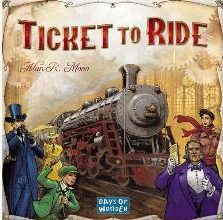 Ticket to Ride is a featured game for 2019! Watch for event announcements.